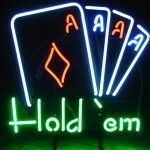 Texas Hold’em is the most popular form of the game of poker. It has become widely known due to the large WSOP tournaments, in which the main event was televised and the winner was awarded with $8 Million. The game basics are fairly simple to learn, the hardest part is tweaking your strategy. Firstly, the dealer shuffles and deals a standard deck of 52 cards. Each player is dealt 2 players, which are dealt clockwise around the table starting with the player after the dealer button. This position is called the small blind, as they are required to place a small amount of chips into the pot before any cards have been dealt. There is also a big blind, which is to the left of the small blind. This position is also required to put in a small amount of chips; however it is normally double the amount of the small blind. Then each player is giving a chance to act. They can call the amount of chips the big blind has put in, fold there hand or raise. After the betting has taken place, 3 community cards are placed face up onto the table, this is known as the flop. Each player uses the cards to make a hand. Another round of betting follows the flop, however players can now check if no bets have been made before them. Then another card is placed face down on the table, known as the turn. Again players can use this card to improve there hand before another round of betting takes place. The last community card is placed down, called the river. Now players make their best hand with 5 of the 7 cards available. Another round of betting takes place before the players turn over their cards to reveal who has the best hand. If a player wins by making every other player fold, not all stages of the hand may take place. For example if a player bets all his chips on the flop and each player folds, there will be no turn or river card and the winner can “muck” his cards, which means giving his cards to the dealer without showing them to the table. For those of you who are completely new to the game of poker we recommend registering at PokerStars.com where you can play for free and learn the basics of the game. Use the PokerStars marketing code PAWSUB465 to get a free $50 bonus when you make your first deposit and start playing for real money.